Any Saints fan who witnessed the win against Wasps a couple of weeks ago and the defeat to Newcastle on Saturday could have been forgiven for wondering where it all went wrong. Saints went from slick and seriously dangerous against Wasps to sloppy and seriously in danger against Falcons. While they were ruthless against the men from Coventry, they were, two fine finishes from Cobus Reinach aside, largely toothless against the team from Newcastle. And, no matter who you're playing in the Premiership - top or bottom - you will get punished if you fail to put teams to away. 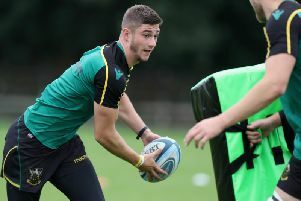 Wasps were never really given a sniff by Saints a couple of weeks ago, with the away side's scores only coming as Chris Boyd's team were moving out of sight. But Newcastle, despite barely landing a punch for 70 minutes of the match, were always in with a chance. Firstly, because of some Saints indiscipline during the first half, which allowed Toby Flood to land two sucker-punch penalties. That put Falcons 6-0 up in a game they certainly didn't deserve to lead and really should have been struggling to salvage a losing bonus point from. Saints eventually responded thanks to some good awareness and speed from South African scrum-half Reinach, but their 7-6 advantage was nowhere near just reward for their abundance of territory and possession. When they got into the Newcastle 22, they were far from clinical, failing to make the final pass and throwing the ball away under pressure. Had they clung on to it, been patient and stopped trying the Hollywood offload, they might have had the scores they wanted. Then, when Reinach scored again 10 minutes into the second half, finishing off a fine move that was started by a Teimana Harrison break, Saints should have suffocated the Falcons. With 50 minutes on the clock, it looked hugely unlikely that the away side would get anything from a game in which they struggled to apply any concerted pressure. But with Saints making poor decisions, turning down kicks at goal and failing to exit their own half efficiently, Newcastle were given an invitation back into the game. And, with a precious away win up for grabs, it was an invitation they were never going to refuse. Saints could not cope with the late pressure, with referee Matthew Carley drawing boos from the home crowd as he continually punished the hosts. And after Dan Biggar's sin-binning, the inevitable happened. On the same day 12 months earlier, Newcastle snatched victory from the jaws of defeat. That left Saints in a precarious position as their poor form continued, and it was to be Jim Mallinder's final league game in charge. Eventually, the black, green and gold stayed up thanks to a recovery in the new year, allied with London Irish's lack of points. But this time round, there will be no such saving graces if the current pattern continues. Saints have lost to the Premiership's bottom side in each of the past two weeks and those results put them in real peril. By failing to take points themselves and presenting them to those below them, they are only heading in one direction. And after Bristol battered Leicester prior to Saints' game against Newcastle, things just keep getting tighter. Games like the one at home to Newcastle have to be targeted and won by Saints if they are to achieve their aims and avoid the trapdoor. Because things don't get any easier, with their festive schedule including trips to Worcester Warriors and Wasps and a home clash with Exeter Chiefs. Those matches would have filled Saints supporters with excitement after the events of a couple of weekends ago. But now the buzz created by the Wasps win has disappeared, the current mood among the Gardens faithful is one of trepidation. And that needs to change by the time that trip to Worcester rolls round four days before Christmas.